Anyone visiting Alderney and hoping to see some dragonflies would do well to head for Mannez, in the east of the island, although true enthusiasts will want to contact kindred spirits at the Alderney Wildlife Trust (www.alderneywildlife.org). Common Darter Sympetrum striolatum (36p): a resident species which most of us in the British Isles have probably seen, had we but known it. The Emperor Dragonfly Anax imperator (45p): with its vivid blue body, one of the largest of British species, and a powerful, vigorous hunter. The Blue-tailed Damselfly Ischnura elegans (56p): another colourful character which, perfectly at home in Alderney, can also be found as far away as the Middle East, Russia and even China. The Brown Hawker Aeschna grandis (66p): not resident but probably a visitor from France. The Black-tailed Skimmer Orthetrum cancellatum (75p): a local, the males of the species selecting territories up to 50 metres long and patrolling them tirelessly. The Red Veined Darter Sympetrum fonscolombii (83p): a rare visitor, spotted in both 2006 and 2007, fuelling speculation that it was breeding at Mannez. 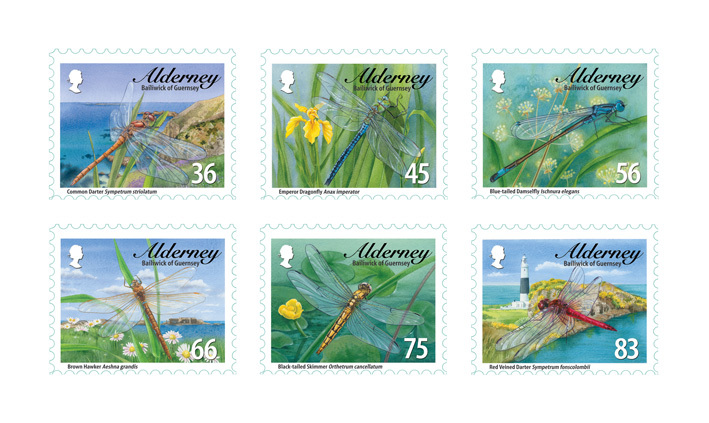 With special thanks to Alderney Wildlife Trust for their assistance with this stamp issue.